The Can Making Machine - HY-S84H Automatic Vertical Can Necker / Flanger is constructed with a vertical type design and controlled by PLC for automatic necking and flanging operations. In order to retain an excellent performance during high speed running, safety devices are completely provided. The can feed and can discharge are in the same direction to be suitable connecting with Automatic Double Can Seamer simply. The thorough shields safely guard the operator, plus an automatic lubricating system is well equipped for smoothness and durability. It is quite easy for operation, adjustment, can size changeover and maintenance for meeting modern Can Making Production. Fully automatic control system for can-making line requirement. High performance programmable logical controller (PLC) offers automatic operations. 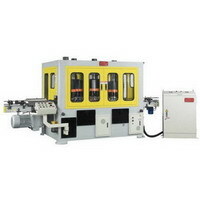 The Machine is Equipped with frequency inverter for variable speed control. Available and quite swift for spare parts changeover with different can sizes, saving the costly downtimes of your production line. Sensors are provided on can path for safety if can bumping occurs, the machine stops automatically. Fast bolt-on shields for safety, beauty and convenience and multi-safety design for machine and personnel safety.